If you can guess why five Dry Creek Valley wineries are hosting an event called "All American Zin Day" on the weekend before the Fourth of July, give yourself five points. Zinfandel, a grape of obscure origins that made the passage as early as the 1830s and has flourished here for over one and a half centuries, indeed makes an all-American wine. If your eye arrests on one of the participants, Rued Winery, and you ask, "Hey, aren't they better known for Rued clone of Chardonnay?" give yourself 10 points. For the fact that they're not quite the same Rueds, take a pass. Just listen and learn. Listen first, closely, to soft-spoken Dee Rued, whose husband's family has been farming grapes here since the 1880s, when Henry Rued immigrated from Switzerland. 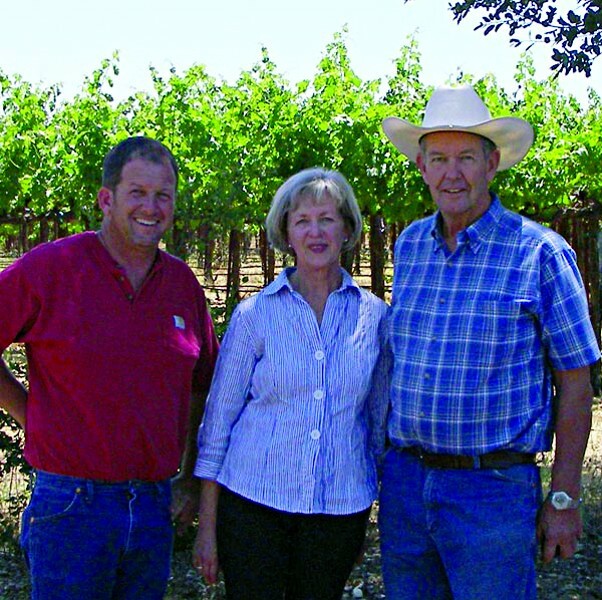 While a family cousin is responsible for the Chardonnay, Richard Rued's father bought a plot on Dry Creek Road in 1957, and Richard took on the two acres of old grapes there as an FFA project. Eventually he planted more, replacing prune orchards, and the vineyards are now managed by son, Tom, who's also on hand in the tasting room, his tractor parked out back. In 2006 they founded their own winery, run by son-and-daughter-in-law team Steve and Sonia. On a short drive across Dry Creek Road, Tom and Dee show off their benchland Zinfandel and Cabernet Sauvignon, which on this late spring day are reaching for the sun, their crop of hard, green berries flowered and set. Richard Rued shows up to temper the optimistic scene; as his father used to say, "You can't tell how good the year has been until the check clears the bank." Spoken like a true farmer. And here, for once, where the vineyards and the production facility are plainly visible through the tasting-room windows, the best product skimmed from the family's 160 acres of grapes is offered at comparatively farm-stand prices. With the freshness of a spritz of sea spray, the 2010 Dry Creek Valley Sauvignon Blanc ($16) has crisp flavors of lemongrass and lychee fruit—clearly an asset to its former home, part of the renowned Kenwood Vineyards Sauvignon Blanc program. The 2008 DVC Zinfandel ($25) has a glossy, lush palate of chewy cherry fruit, vanilla and graham cracker; the 2009 DCV Zinfandel ($25), a more intense and more tart, plum-cherry character, which will likely continue to unfold. If I were keeping score, I'd say that's a 95-pointer. Rued Winery, 3850 Dry Creek Road, Healdsburg. Open daily 11am to 4:30pm. Tasting fee $5. 707.433.3261. All-American Zin Day, Saturday, June 30, 11am–4pm; wine and barbecue. Advance tickets $25 at www.allamericanzinday.com, $30 at the door.